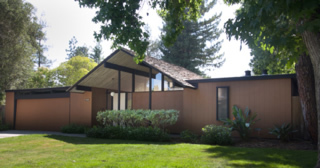 Not so on campus, however, where Eichler, retaining his well-known “gruff” manner, according to client Christiane Andreopoulos, was willing to change his designs to meet client requests. 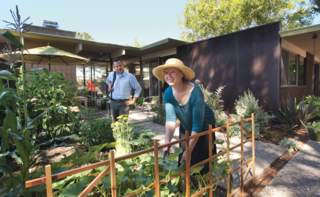 Carolyn Piotroski tends to her backyard garden while husband Joseph looks on. Andreopoulos, a French woman, whose husband Spyros, a Greek, came to Stanford in 1963 as administrative director of communications for the hospital and medical school, remembers approaching Eichler at his Fallen Leaf Park subdivision in Los Altos, inquiring about a home for their lot on campus. “Not much social grace,” she recalls. “He was direct, which is fine. 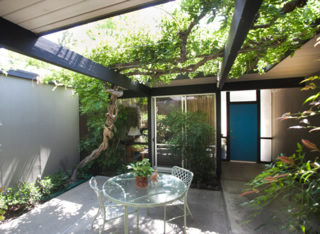 Still, when Andreopoulos suggested that significant changes be made in the plan—like eliminating the family room behind the kitchen, replacing it with a covered patio that occupied the same footprint—Eichler said yes. Beautiful gable model spotted on Vernier Place. The result, she said, is her favorite area of the house, filled with light, a place she graded papers when she taught at a private school. “I feel like I'm outside without being in the wind,” she says. And the covered patio gave her daughter a sheltered spot for outdoor play. Wisteria-filled atrium in Christiane Andreopoulos' Eichler. Canadians Ronald McKinnon, an international economist (one of his books is The Order of Economic Liberalization: Financial Control in the Transition to a Market Economy), and Margaret McKinnon, a writer and editor formerly for Sunset, settled into a Palo Alto Eichler when he arrived at Stanford in 1961. But they wanted to live on campus. So they leased a lot and got a mailing from Eichler offering his services. “I called him and said we had a problem site, a slope. Eichlers wouldn't work. So I'm going to hire an architect,” Margaret recalls. As it turns out, working with the architect proved a “disastrous exercise,” as costs mounted and the architect's proposed solutions did not please. So the McKinnons found themselves visiting model homes at Fallen Leaf Park.